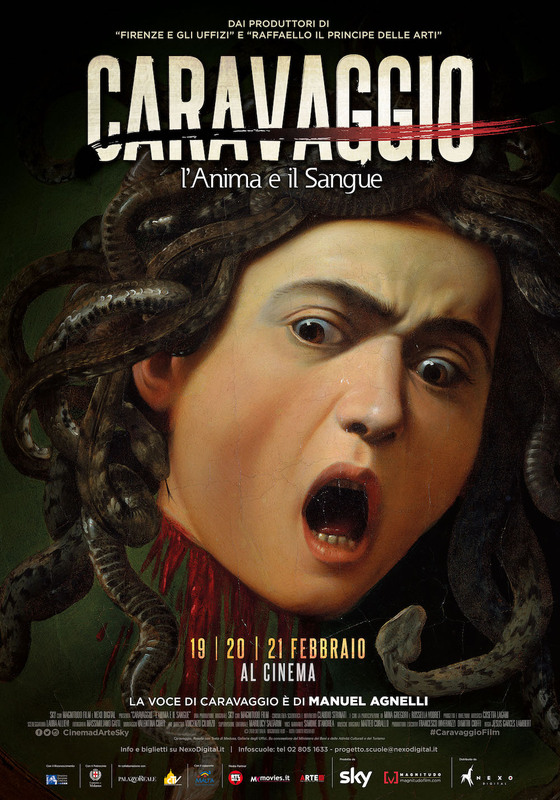 Caravaggio – l’Anima e il Sangue is the title of the latest art movie produced by Sky and Magnitudo Film, entirely devoted to the fascinating and controversial figure of Michelangelo Merisi, the XVI century Italian artist known as Caravaggio, from the name of the village where his parents were born. The movie, directed by the award winning Mexican director Jesus Garces Lambert, will be distributed by Nexo Digital in over 350 Italian movie theatres listed on the www.nexodigital.it website – a true record breaker for a similar production, following the success of “Raphael – The Lord of the Arts” released last year – only from 19 to 21 February 2018. It will be then released worldwide, with subtitled versions, starting from Europe and aiming to reach over 50 Countries and 2500 theatres overall. A spectacular and rip-roaring tale, the movie is indeed full of action, anguish and blood, as it pieces together the accurate historical reconstruction of Caravaggio’s life and artistic career, and the bewildering yet compelling interpretation of the artist’s inner feelings through modern, highly symbolic scenes and settings often contaminated by visual art-like inspiration. The original staging, which unveils an uncovered side of the man and his incredibly modern, almost “rock” soul, is only highlighted by the succession of classical and electronic music in the soundtrack by Matteo Corallo, and by the warm and soulful voice of Manuel Agnelli. Italy’s most emblematic rock figure, the frontman of the indie band Afterhours – who recently became a star thanks to his judge role in the X Factor TV show, and also counts successful tours in the US and prominent collaborations with artists such as Greg Dulli and Mark Lanegan – appeared to be the ideal choice. A maverick artist always able to express anger, pain and sorrowful hope in his music, he gives voice to Caravaggio’s intimate thoughts as imagined and scripted by Laura Allievi. “This has been a challenge for me, definitely something different”, Agnelli said. “Yet, I’m used to express emotions through my voice. I enjoyed myself and I was just excited in voicing such a great artist”. In the modern-like, symbolic reenactments of his torment, the painter is played by a non-professional actor, a Neapolitan cable guy part of the technical film crew. “We wanted to create a moving, powerful and universal tale, also showing Caravaggio’s contemporary soul”, Cosetta Nagani, Sky artistic director, explained. “And just as the painter loved to use common folk, often prostitutes or street kids, as models for his paintings, we decided not to opt for professional actors”. A true artistic genius capable of radical innovation in Italian art and beyond – though he was considered an outsider and his influence was only effectively acknowledged by XVII century’s painters – Caravaggio was a tormented man and artist. He always struggled with contradictory urges: constraint and the search for freedom, hardship and dissipation, pain and passion, sin and quest for mercy and salvation. Impatient with his own patrons, often involved in fights and hassles, he had to run away more than once to escape justice, bringing his art to different Italian and foreign cities. 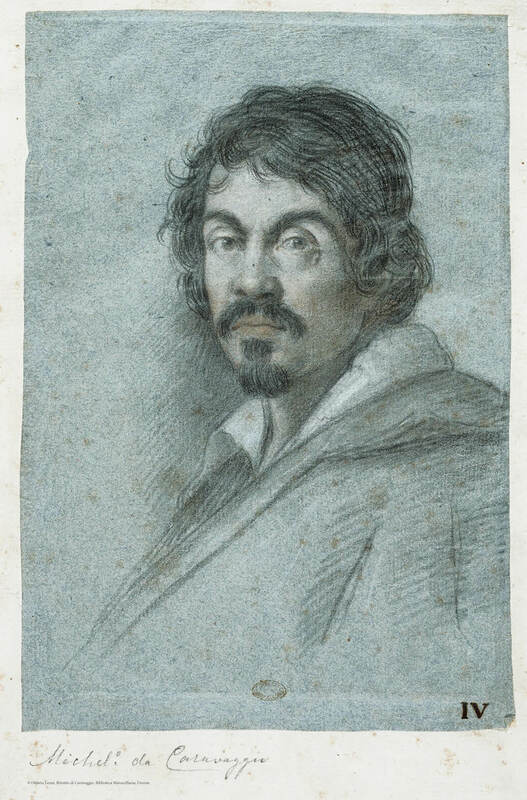 The movie retraces his meandering career and life thanks to precious original papers – in some case recent findings including police reports and allegations – and to the scientific advisory and speeches by prof. Claudio Strinati, a passionate art historian who dedicated a broad part of his work to Caravaggio. 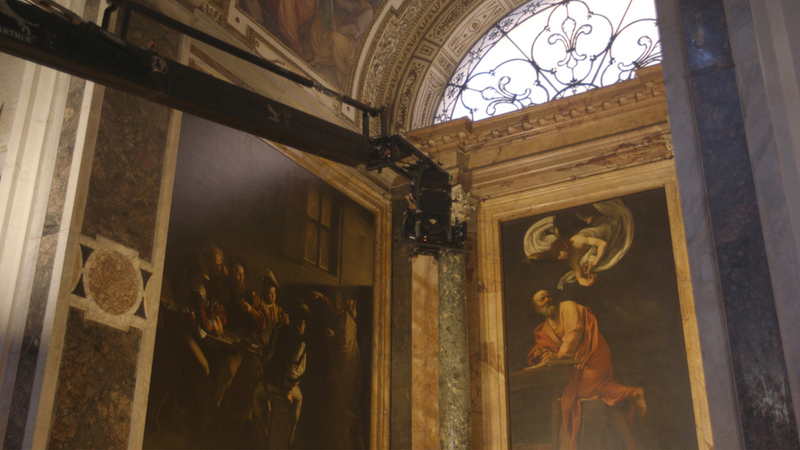 It also features contributes by prof. Mina Gregori (President at the Fondazione di Studi di Storia dell'Arte Roberto Longhi) and Rossella Vodret, who curated the ‘Dentro Caravaggio' exhibit at Palazzo Reale in Milan. 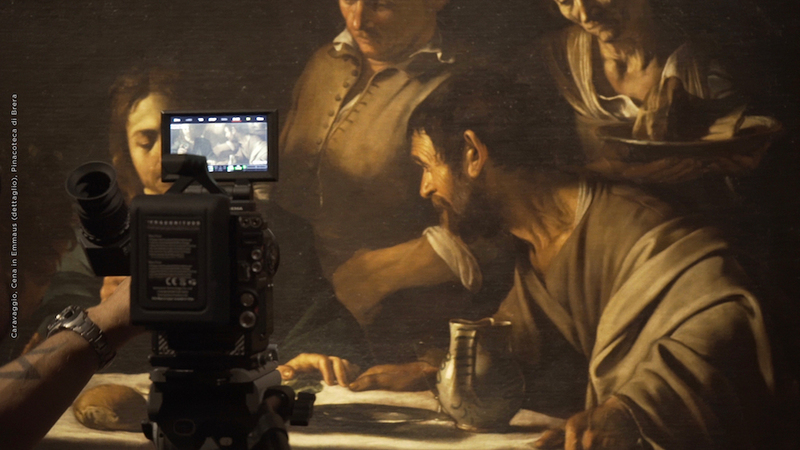 The movie features many of the painter’s masterpieces, reconstructing their making also thank to state-of-the-art technology: filmed in 8K UHD (the current highest ultra high definition television) and with a 2.40 aspect ratio, it offers a wider and more natural vision and, at the same time, a deeper one, allowing the audience to detect every single brush stroke. Or even – as an art historian joining the press preview noticed – a paintbrush hair never noticed before in one of his paintings. The screenplay also retraces the places where the artist lived and worked, featuring 5 cities and over 15 locations. From the Archives of the Diocese of Milan (where Merisi’s baptism certificate was found, attesting that he was born in Milan and not in Caravaggio as it was previously thought) to the majestic churches of St. Louis of the French, Santa Maria del Popolo and Sant’Agostino, as well as the Vatican Museums in Rome. Here, many of his masterpieces still can be seen in their original settings: The Calling of Saint Matthew and The Martyrdom of Saint Matthew in the Contarelli Chapel in St. Louis of the French and the The Conversion of Saint Paul on the Road to Damascus and The Crucifixion of Saint Peter in the Cerasi Chapel in Santa Maria del Popolo. The journey continues to Florence, Naples – where Caravaggio found refuge after being exiled from Rome on a murder charge, and where his impressive painting The Seven Works of Mercy can be admired at the church of Pio Monte della Misericordia – and La Valletta, in Malta; here Caravaggio painted The Beheading of Saint John the Baptist in the St John's Co-Cathedral, before being accused of outrage and jailed. Once again escaped to Italy – in Sicily first, then Naples again – and finally readmitted to his beloved Rome, he mysteriously disappeared on the Latium seashore while sailing towards the Eternal City, which he would have never seen again. Even though the movie does not solve the mystery of his death, it can claim an unprecedented operation: thanks to the partnership with Vatican Media – the national broadcaster of the Vatican City State –, the Vatican Confraternity of Sant’Anna dei Parafrenieri and the Fabric of Saint Peter (the institution responsible for the conservation and maintenance of St. Peter's Basilica), and using complex, modern digital techniques, Jesus Garces Lambert and his crew have been able to virtually reposition one of Caravaggio’s masterpieces – the Madonna dei Palafrenieri, today housed in the Borghese Gallery in Rome – in its original place over the altar dedicated to St. Michael the Arcangel, in St. Peter. Commissioned to Caravaggio by the Confraternity in 1605, the impressive artwork represents Saint Anne with the Holy Virgin and baby Jesus fighting the snake (an evil symbol) was only displayed for a few days in its intended seat, and then rejected. Apparently, the decision came from Scipione Borghese, the Pope’s nephew, aiming to buy the painting at a convenient price; the official motivation, though, was the scandal created by the fact that the model for the Virgin was a known courtesan and Caravaggio’s lover, obscuring with her glooming beauty the figure of the Saint, represented as an old and humble woman. The refusal was only one of the many events beating the painter’s soul, who had also witnessed his father’s death from the plague when he was only a child. His whole life, as prof. Strinati recalls, “was a troubled journey haunted by a deep sense of injustice, evil and darkness”. A darkness he strived to fight, bringing beams of light just as he did in his own art.